Low producing well or spring? No problem, just call Pure Water Plumbing for free on-site quote. Call John 541-660-1462 for best pricing on all water systems. Serving all of Southern Oregon, Rogue Valley. State certified Water Treatment Installer. All work is satisfaction guaranteed. Our storage water tanks are manufactured using resins to ensure safe storage of potable drinking water. 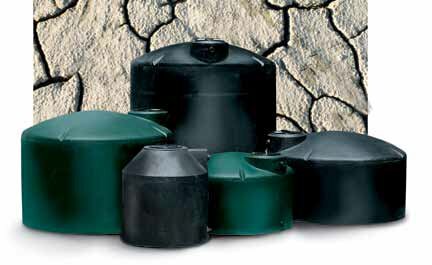 550 to 2500 gallon available in above or below ground water cistern tanks, larger tanks upon request. Complete delivery and set-up. Depending on your needs, filtration or treatment options available. Concrete below ground tanks available upon request. 1. Water is absolutely essential to the human body's survival. A person can live for about a month without food, but only about a week without water. 2. Water helps to maintain healthy body weight by increasing metabolism and regulating appetite. 5. For a majority of sufferers, drinking water can significantly reduce joint and/or back pain. 8. Water naturally moisturizes skin and ensures proper cellular formation underneath layers of skin to give it a healthy, glowing appearance. 10. Water is the primary mode of transportation for all nutrients in the body and is essential for proper circulation. 1. In order to capitalize on the health benefits of water, it is essential to draw from a clean source of water. 2. Drinking impure, contaminated water is the leading cause of epidemic disease in developing countries. 3. There are more than 2100 known drinking water contaminants that may be present in tap water, including several known poisons. 4. Bottled water does not offer a viable alternative to tap water. 5. Municipal water treatment facilities cannot always control for the outbreak of dangerous bacterial contaminants in tap water. 6. The only way to ensure pure, contaminant-free drinking water is through the use of a point-of-use filtration system. 7. Several types of cancer can be attributed to the presence of toxic materials in drinking water. 8. Clean, healthy drinking water is essential to a child's proper mental and physical development. 9. According to the EPA, lead in drinking water contributes to 480,000 cases of learning disorders in children each year in the United States alone. 10. It is especially important for pregnant women to drink pure water as lead in drinking water can cause severe birth defects. 1. Water filters provide safer better tasting and better smelling drinking water by removing chlorine and bacterial contaminants. 3. The purchase of a countertop filter or under sink system, results in a source of clean, healthy water that costs much less than bottled water. 5. A carbon water filter or reverse osmosis system can selectively remove dangerous contaminants from drinking water. 9. Drinking pure water is especially important for children. Water filters provide the healthiest water for children's developing immune systems.